As we embraced Chinese New Year at the start of the month, we looked at the symbolism of dragons in the Chinese culture. Dragons traditionally symbolise potent and auspicious powers, particularly control over water, rainfall, typhoons, and floods. The dragon is also a symbol of power, strength, and good luck for people who are worthy of it in East the tension building, to drum beats, between the colourful, silk dragon and the fiery sun that remains elusive in the chase throughout the dance. The story goes that the dragon wants to extinguish light (the pursuit of the sun) but is frightened away from villages by sources of light and noise from firecrackers and villagers drums. 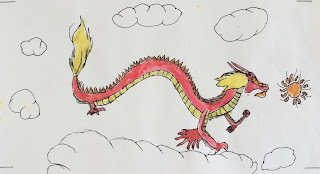 We sketched with fine pens and dyed our dragons carefully with a fine brush using red, orange or yellow dye. We also described a dragon’s qualities in a poem using description language. We looked at their physical powers, movement and mythical attributes. These precise words help form visual imagery in our poems. We enjoyed listening to quiet Chinese music played on traditional instruments while the artists worked on their dragons. Well done Rm 3! Your dragons look magnificent. When did you make them? Awesome work room 3! I like your art work a lot! How did you make them? WOW! Those Dragons look so cool. I love all the detail you guys put into the art! How did you get them so bright and colourful? These dragons look amazing! I love the detail that you have drawn with the black vivid and the firey nature of a dragon by the use of warm colours to paint their spirit!